18.01.10 [FTI] – THE 10TEN PROJECT – Briquette charity event. 18.01.13 [FTI] – Fanmeeting en Busan. 18.01.16 [SH] – “여도” en Hanjeon Art Center, 8PM (KST). 18.01.17 [SH] – “여도” en Hanjeon Art Center, 4PM y 8PM (KST). 18.01.18 [SH] – “여도” en Hanjeon Art Center, 8PM (KST). 18.01.20 [SH] – “여도” en Hanjeon Art Center, 3PM y 7PM (KST). 18.01.21 [SH] – “여도” en Hanjeon Art Center, 2PM (KST). 18.01.23 [SH] – “여도” en Hanjeon Art Center, 8PM (KST). 18.01.24 [SH] – “여도” en Hanjeon Art Center, 8PM (KST). 18.01.25 [SH] – “여도” en Hanjeon Art Center, 8PM (KST). 18.01.27 [SH] – “여도” en Hanjeon Art Center, 3PM y 7PM (KST). 18.01.30 [SH] – “여도” en Hanjeon Art Center, 8PM (KST). 18.01.31 [SH] – “여도” en Hanjeon Art Center, 8PM (KST). 18.02.02 [SH] – “여도” en Hanjeon Art Center, 8PM (KST). 18.02.03 [SH] – “여도” en Hanjeon Art Center, 3PM y 8PM (KST). 18.02.04 [SH] – “여도” en Hanjeon Art Center, 2PM y 6PM (KST). 18.02.06 [SH] – “여도” en Hanjeon Art Center, 8PM (KST). 18.02.07 [SH] – “여도” en Hanjeon Art Center, 4PM y 8PM (KST). 18.02.09 [SH] – “여도” en Hanjeon Art Center, 8PM (KST). 18.02.10 [SH] – “여도” en Hanjeon Art Center, 3PM y 7PM (KST). 18.02.14 [FTI] – 「FTISLAND POPPING MINI LIVE PARTY」 en Osaka, 3PM y 7PM. 18.02.16 [FTI] – 「FTISLAND POPPING MINI LIVE PARTY」 en Yokohama, 3PM y 7PM. 18.02.20 [FTI] – 「FTISLAND POPPING MINI LIVE PARTY」 en Nagoya, 3PM y 7PM. 18.02.24 [SH] – “여도” en Hanjeon Art Center, 3PM y 7PM (KST). 18.02.25 [SH] – “여도” en Hanjeon Art Center, 6PM (KST). 18.04.26 [FTI] – 「FTISLAND Arena Tour 2018 -PLANET BONDS-」 en Osaka-jō Hall, 6:30PM. 18.05.03 [FTI] – 「FTISLAND Arena Tour 2018 -PLANET BONDS-」 en Nippon Gaishi Hall de Aichi, 5PM. 18.05.08 [FTI] – 「FTISLAND Arena Tour 2018 -PLANET BONDS-」 en Budokan Arena de Tokio, 6:30PM. 18.05.09 [FTI] – 「FTISLAND Arena Tour 2018 -PLANET BONDS-」 en Budokan Arena de Tokio, 6:30PM. 18.05.11 [SH] – “여도” en Seoul Arts Center Towol Theater, 8PM (KST). 18.05.12 [SH] – “여도” en Seoul Arts Center Towol Theater, 6PM (KST). 18.05.13 [SH] – “여도” en Seoul Arts Center Towol Theater, 6PM (KST). 18.05.15 [SH] – “여도” en Seoul Arts Center Towol Theater, 8PM (KST). 18.05.16 [SH] – “여도” en Seoul Arts Center Towol Theater, 4PM y 8PM (KST). 18.05.17 [SH] – “여도” en Seoul Arts Center Towol Theater, 8PM (KST). 18.05.18 [SH] – “여도” en Seoul Arts Center Towol Theater, 8PM (KST). 18.05.19 [SH] – “여도” en Seoul Arts Center Towol Theater, 2PM y 6PM (KST). 18.05.20 [SH] – “여도” en Seoul Arts Center Towol Theater, 6PM (KST). 18.05.22 [SH] – “여도” en Seoul Arts Center Towol Theater, 2PM y 6PM (KST). 18.05.23 [SH] – “여도” en Seoul Arts Center Towol Theater, 4PM (KST). 18.06.30 [FTI] – ‘ROCK STAR 2018’ en KBS Arena Hall, 5PM (KST). 18.07.07 [FTI] – 2018 GLOBAL LEADING Lotte Hotel Fanmeeting “Following My Heart” en Seoul. 18.07.16 [JH] – Unexpected Heroes Fanmeeting en Shinagawa Intercity Hall de Tokio. 18.09.05 [FTI] – 「FTISLAND AUTUMN TOUR 2018 -Pretty Girl-」 en Zepp Nagoya de Aichi. 18.09.06 [FTI] – 「FTISLAND AUTUMN TOUR 2018 -Pretty Girl-」 en Zepp Nagoya de Aichi. 18.09.08 [FTI] – 「FTISLAND AUTUMN TOUR 2018 -Pretty Girl-」 en Hiroshima Bunka Gakuen HBG Hall de Hiroshima. 18.09.11 [FTI] – 「FTISLAND AUTUMN TOUR 2018 -Pretty Girl-」 en Zepp Osaka Bayside de Osaka. 18.09.12 [FTI] – 「FTISLAND AUTUMN TOUR 2018 -Pretty Girl-」 en Zepp Osaka Bayside de Osaka. 18.09.16 [FTI] – 「FTISLAND AUTUMN TOUR 2018 -Pretty Girl-」 en Toyosu Pit de Tokio. 18.09.17 [FTI] – 「FTISLAND AUTUMN TOUR 2018 -Pretty Girl-」 en Toyosu Pit de Tokio. 18.09.19 [FTI] – 「FTISLAND AUTUMN TOUR 2018 -Pretty Girl-」 en Niigata Prefectural Civic Center de Niigata. 18.09.21 [FTI] – 「FTISLAND AUTUMN TOUR 2018 -Pretty Girl-」 en Sendai Sunplaza de Miyagi. 18.09.23 [FTI] – 「FTISLAND AUTUMN TOUR 2018 -Pretty Girl-」 en Nagaragawa Convention Center de Nagano. 18.09.28 [FTI] – 「FTISLAND AUTUMN TOUR 2018 -Pretty Girl-」 en Nippon Budokan de Tokio. 18.10.06 [FTI] – Concierto en Bangkok como conmemoración de las realciones entre Corea del Sur y Tailandia. 18.10.14 [HK] – 2018 Celebrity Charity Bowling Tournament. 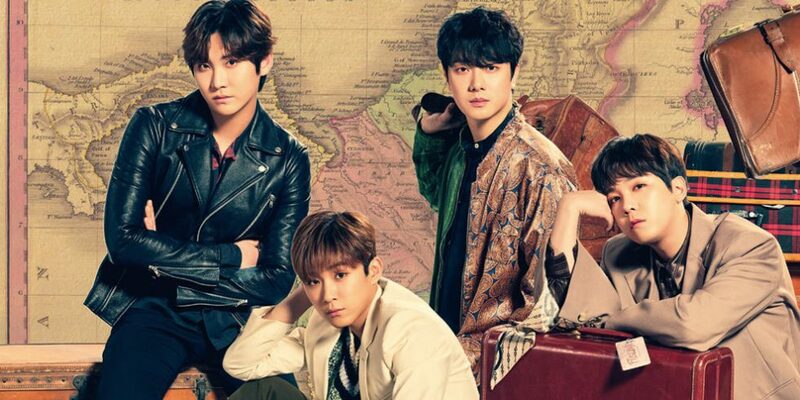 18.11.04 [FTI] – 2018 FTISLAND Live [+] en Taipei. 18.12.05 [MH] – Mr House Husband en KBS 2, 10:55 PM KST. 18.12.12 [MH] – Mr House Husband en KBS 2, 10:55 PM KST. 18.12.19 [MH] – Mr House Husband en KBS 2, 10:55 PM KST. 18.12.20 [HK] – Lee Hong Gi 2018 Solo Concert en el Century Hall de Nagoya. 18.12.24 [HK] – Lee Hong Gi 2018 Solo Concert en el Pacifico Yokohama de Yokohama. 18.12.25 [HK] – Lee Hong Gi 2018 Solo Concert en el Pacifico Yokohama de Yokohama. 18.12.26 [MH] – Mr House Husband en KBS 2, 10:55 PM KST. 18.12.27 [HK] – Lee Hong Gi 2018 Solo Concert en el Orix Theatre de Osaka. 18.12.28 [HK] – Lee Hong Gi 2018 Solo Concert en el Orix Theatre de Osaka.